What's With The Nuns, Japan? 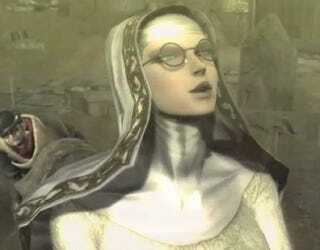 Whether it be action title Bayonetta, fighting game Guilty Gear or role-playing game Rune Factory, habit-wearing characters have made appearances in video games. Many Japanese games simply use nun accoutrements. But why? Nuns are part of the Japanese landscape. While they are not as readily visible in public as Buddhist priest zipping around on their scooters, they are occasionally seen in the train stations, the supermarket, wherever. The point is that they exist, and Japanese people are not as likely to be surprised by seeing them as, say, a sumo wrestler or a geisha (well, outside of Kyoto, that is!). The biggest religions in Japan are Shinto and Buddhism. Many Japanese take elements of both in their lives, and it is often said that Japanese are blessed by Shinto priests as babies and then buried by Buddhist priests. There is a fluidity between the two. However, it is now said that Japanese are married in a church. These churches are typically wedding chapels. They might have religious imagery and there might even be a priest (usually a foreigner playing a priest) marrying them, but it is not a religious ceremony. It is a marriage ceremony. There are about a million or more Christians in Japan with majority of them being concentrated in Western Japan (Kyoto, Osaka, Kobe) as that is where much of the missionary activity was carried out during the 16th century. As Christianity gained Japanese followers, Toyotomi Hideyoshi, who had Osaka Castle built, banned Jesuits and then later crucified 26 Franciscans in Nagasaki. In an effort to unify the country and control the country's population, Hideyoshi continued to persecute the Japanese Christians, all but rubbing out the religion completely. A group of "hidden Christians" retreated to the mountains and the hills in the areas outside the cities. Areas where they lived and worshiped still exist today. In the 19th century, the Meiji Era brought in enlightened ideas and reintroduced tolerance towards Western religions. The following century saw the flourishing of missionary schools. Christians today might make up only one percent of the population, but the religion itself is not something that is entirely foreign to Japan. Crucifixes are common women's jewelry — something that might raise eyebrows with believers. However, it's important to note how Buddhist statues and imagery are often adopted as knick-knacks or interior decor in the West. The last Japanese Prime Minister, Taro Aso, is Christian, which is a testament to the country's current religious tolerance. Try to imagine America electing a President who believes in a religion that only one percent of the country does! Christian imagery is common in Japanese video games, manga, anime and even movies. During the 1970s, as nun exploitation films swept through Europe, Japan also began making its own nunsploitation films with movies like Norifumi Suzuki's School of the Holy Beast and Masaru Konuma's Cloistered Nun: Runa's Confession. And while the Europeans attacked the church head on, the Japanese filmmakers weren't necessarily simply commenting on Christianity, but rather, authority itself. In the years following the turbulent 1960s, those Japanese nunsploitation films provided an outlet for directors like Suzuki to not only shock audiences, but criticize the establishment. "Drawing upon the absence of God," Suzuki told me last year in an interview, "causes believers to seek a painful God." The appearance of nuns in Japanese popular culture is not an aberration or simply an attempt to appear Western, but part of the very fabric of organized religion in The Land of the Rising Sun.